It’s no substitute for testing with real devices, but the “device wall” view in this Chrome plug-in is a nifty way of getting an overview of a site’s responsiveness at a glance. A nice rundown of some of the fun you can have with viewport units. I’m very glad the problems with vh units I wrote about a little while back is getting fixed in Chrome for mobile. When I was first styling Resilient Web Design , I made heavy use of vh units. The vertical spacing between elements—headings, paragraphs, images—was all proportional to the overall viewport height. It looked great! Then I tested it on real devices. 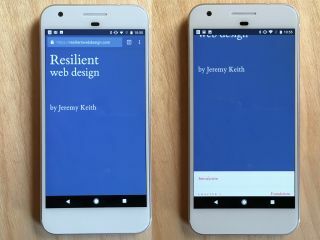 Here’s the problem: when a page loads up in a mobile browser—like, say, Chrome on an Android device—the URL bar is at the top of the screen. The height of that piece of the browser interface isn’t taken into account for the viewport height. That makes sense: the viewport height is the amount of screen real estate available for the content. The content doesn’t extend into the URL bar, therefore the height of the URL bar shouldn’t be part of the viewport height. But then if you start scrolling down, the URL bar scrolls away off the top of the screen. So now it’s behaving as though it is part of the content rather than part of the browser interface. At this point, the value of the viewport height changes: now it’s the previous value plus the height of the URL bar that was previously there but which has now disappeared. I totally understand why the URL bar is squirrelled away once the user starts scrolling—it frees up some valuable vertical space. But because that necessarily means recalculating the viewport height, it effectively makes the vh unit in CSS very, very limited in scope. In my initial implementation of Resilient Web Design , the one where I was styling almost everything with vh, the site was unusable. Every time you started scrolling, things would jump around. I had to go back to the drawing board and remove almost all instances of vh from the styles. I’ve left it in for one use case and I think it’s the most common use of vh: making an element take up exactly the height of the viewport. The front page of the web book uses min-height: 100vh for the title. But as soon as you scroll down from there, that element changes height. The content below it suddenly moves. Let’s say the overall height of the browser window is 600 pixels, of which 50 pixels are taken up by the URL bar. When the page loads, 100vh is 550 pixels. But as soon as you scroll down and the URL bar floats away, the value of 100vh becomes 600 pixels. There’s a mixed message here. On the one hand, the browser is declaring that the URL bar is part of its interface; that the space is off-limits for content. But then, once scrolling starts, that is invalidated. Now the URL bar is behaving as though it is part of the content scrolling off the top of the viewport. The result of this messiness is that the vh unit is practically useless for real-world situations with real-world devices. It works great for desktop browsers if you’re grabbing the browser window and resizing, but that’s not exactly a common scenario for anyone other than web developers. It’s such a shame. A piece of CSS that’s great in theory, and is really well supported, just falls apart where it matters most. Update: There’s a two-year old bug report on this for Chrome, and it looks like it might actually get fixed in February. This is a clever technique by Dave—use viewport units to make a lightweight lightbox. Some really great CSS tips from Rich on sizing display text for multiple viewports. This is what tells all our browsers on all our devices to set the viewport to be the same width of the current device, and to also set the initial scale to 1 (not scaled at all). This essentially allows us to have responsive design consistently. The viewport value for the meta element was invented by Apple when the iPhone was released. Back then, it was a safe bet that most websites were wider than the iPhone’s 320 pixel wide display—most of them were 960 pixels wide …because reasons. So mobile Safari would automatically shrink those sites down to fit within the display. If you wanted to over-ride that behaviour, you had to use the meta viewport gubbins that they made up. That was nine years ago. These days, if you’re building a responsive website, you still need to include that meta element. That seems like a shame to me. I’m not suggesting that the default behaviour should switch to assuming a fluid layout, but maybe the browser could just figure it out. After all, the CSS will already be parsed by the time the HTML is rendering. Perhaps a quick test for the presence of a crawlbar could be used to trigger the shrinking behaviour. No crawlbar, no shrinking. Maybe someday the assumption behind the current behaviour could be flipped—assume a website is responsive unless the author explicitly requests the shrinking behaviour. I’d like to think that could happen soon, but I suspect that a depressingly large number of sites are still fixed-width (I don’t even want to know—don’t tell me). There are other browser default behaviours that might someday change. Right now, if I type example.com into a browser, it will first attempt to contact http://example.com rather than https://example.com. That means the example.com server has to do a redirect, costing the user valuable time. You can mitigate this by putting your site on the HSTS preload list but wouldn’t it be nice if browsers first checked for HTTPS instead of HTTP? I don’t think that will happen anytime soon, but someday …someday. A comparison of when to use percentages and when to use vw/vh in your CSS. A handy little bookmarklet for quickly checking how a site might look at different screen sizes, and you can customise it to use whichever screen sizes you like. Useful advice from Tim on preparing your responsive site for IE10’s new “snap mode”. Don’t worry: it doesn’t involve adding any proprietary crap …quite the opposite, in fact. I’ve been a very good boy this year so I hope you don’t me asking for a little present. What I’d really like for Christmas is for you to fix that strange orientation scaling bug in Mobile Safari. Just in case you’ve forgotten about it, my friend Scott—who has been a very, very good boy this year (what with that whole Boston Globe thing)—put together a test page quite a while back to demonstrate the problem. Basically, if I set meta name="viewport" content="width=device-width, initial-scale=1.0" then it means a pixel should be equal to a pixel: in portrait view, the width should be 320 pixels; in landscape view the width should be 480 pixels. But in Mobile Safari, if I move from portrait to landscape, the width jumps to a value larger than 480 pixels, which means the hapless user must double tap to bring the scale down to 1:1. Now, admittedly, I could just set meta name="viewport" content="width=device-width" and leave it at that (or I could additionally declare minimum-scale=1.0). But then when the user changes from portrait to landscape, although it doesn’t have the same over-zooming behaviour, it does scale up. That means I’m not getting the full 480 pixels (it’s effectively still a 320 pixel wide display, even in landscape). I could make the bug disappear by adding maximum-scale=1.0 or user-scaleable=no but that’s the cure that kills the patient. I also did some hacking with Shi Chuan but what we come up with still feels fairly clunky. So that’s why I’m writing to you, Father Applemas. Won’t you fix this bug for me? My friend PPK thinks you won’t fix this bug because it would trigger a reflow (and repaint) of the page …but I know that can’t be the reason because the bug doesn’t occur when going from landscape to portrait! Also—and this is the really strange part—If I’m looking at a web page on my iPhone/Pod in a custom browser (like the Twitter app), rather than using Mobile Safari, then the bug doesn’t occur. I don’t get, Apple Claus. Why have one behaviour for webviews in other people’s apps and a different behaviour for your own app? Anyway, if you could see your way to granting this boy’s wish, it would make for a webby Christmas. P.S. By this time next year, it would be lovely to have access to the camera (and other device APIs) from the browser …but I’m getting ahead of myself. Update: the bug has been fixed in iOS 6. A handy little tool for testing responsive designs by automatically changing your browser viewport size.